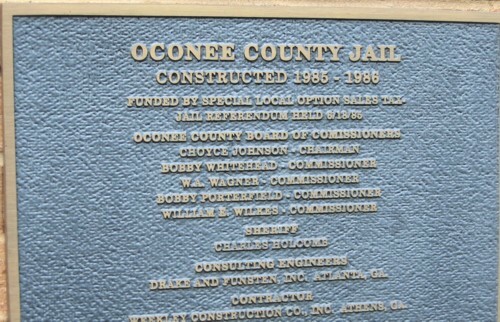 Does Oconee County need a new $ 25 Million Courthouse? before that was the courthouse site for Clarke County which included Oconee County. Longtime officials posed for this picture when the renovated courthouse was reopened and dedicated in November 1998. L-R, Wendell Dawson, BOC Chair; Judge James Barrow, Clerk of Court, Sandra Glass, Probate Judge Reba Hammond, Sheriff Charles Holcomb, and jailer, Willie Mae Carson. - Often one hears that a new facility will provide for “next fifty years” but is that really what happens? c. Do current officials presume to be smarter than past and future county officials – really something to think about! - Do citizens really see public facilities as Memorials to current officials? - Do our ‘approaching retirement” leaders really desire a personal legacy by having a General Obligation bond be part of the vote to allow them to build the courthouse before leaving office? - How much behind the scenes planning and politics have preceded this perceived rush for a new Courthouse? - Do we want the same leaders planning the courthouse that located a $1-2 Million Farmington Fire Station on a single lane country road out of sight of taxpayers and hard to access?